Before you know it, 22 November will be upon us and it will be time for the annual traditions of meeting up with family, eating too much and remembering the history of this holiday. To get your students engaged in the run-up to Thanksgiving, we’ve handpicked a range of lesson ideas and imaginative tasks that are ideal for this time of year. Alternatively, engage children with all aspects of Thanksgiving using these Maths and literacy resources to practise writing and math tasks combining key skills with the festive theme. This 10 page activity packet includes Thanksgiving reading, writing and math activities for younger primary students. Thanksgiving Math Mystery "Case of the Gobbler's Curse" is a fun way to engage your students. In this math detective story people have all started to lose the power of speech and cannot stop making "gobble, gobble" noises! Students must solve the worksheets to reveal clues as to which potion will cure those under the Gobbler's Curse. Make your day a little easier and try one of our math mysteries, your students will love them! Time to get out the crayons, scissors and glue to create these crafts and music compositions, designed to brighten up the classroom ahead of the holiday and encourage learners to discuss the importance of pilgrims, Native Americans and the Mayflower. Thanksgiving Crafts - Thanksgiving Icons! This is a great Thanksgiving Craft. Included is a template that the students will color, cut and then glue together! It's a great Thanksgiving keepsake. Or, you can have the students make the craft ahead of time and use them to decorate the classroom. It has pictures of pilgrims, the Mayflower, native Americans. Made from regular photocopy paper (8 1/2 x 14), all students require are coloring pencils, scissors and glue (glue sticks recommended). Includes two versions of this craft - a smaller and a larger version. A creative way to teach about Thanksgiving while creating a super cute turkey. Your kiddos will love creating and putting on their own personal touches on this unique twist on a traditional Turkey craft. Paper lanterns are great for developing fine motor skills such as: folding, coloring, painting, gluing, cutting, listening and following directions. 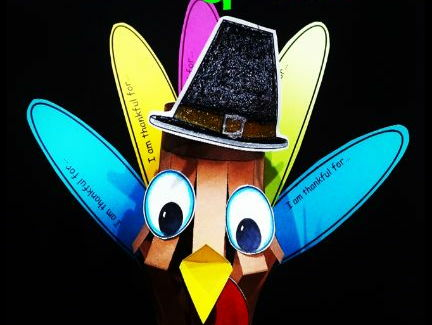 Embedded within this Turkey project there are several activities to extend your students learning about Thanksgiving. This unit can be approached in several ways. Either as a quick Turkey craft that will take about 90 minutes to complete. Or as long, in-depth project that will take upwards of a week or two to complete. In my classroom, creating the basic lantern will take my kiddos about 90 minutes (coloring and assembly). Adding a writing competent will take an additional 45 to 60 minute block of time to complete. A cute little craftivity for you little ones to make. They can write one thing they are thankful for on each feather before creating their turkeys. This makes a great little gift for parents for Thanksgiving. 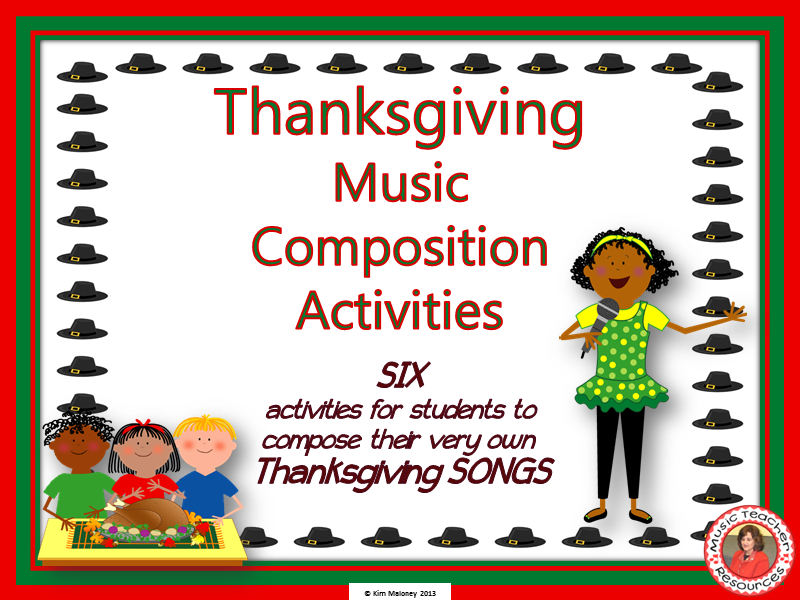 Have your students compose and perform their very own songs for THANKSGIVING!! ♦ Teacher Ideas and Suggestions. ♦ Each of the SIX music composition/song activities comes in TWO versions, color, which is perfect for you the teacher to project as you explain/model the activity AND black and white for the student to color while they wait for inspiration OR when they are completed their song! ♫ Students compose their very own THANKSGIVING song by choosing from the given bars/measures of rhythm with words and placing them in an order of their choosing. ♫ The more advanced students in your class can use the given measures/bars as a springboard for creating their own THANKSGIVING verse for their song and using the templates provided to notate their song! ♫♫ NOW INCLUDED is a song writing activity sheet where the pitches have NOT been specified. Teachers can use this sheet to draw the clef and pitches they have been working on in class.